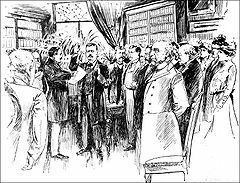 As previously noted, William McKinley and Theodore Roosevelt were inaugurated as U.S. President and Vice President on March 4, 1901. 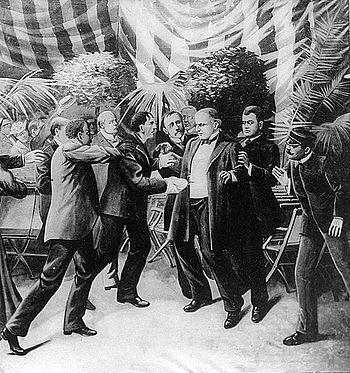 Only six months later, on September 6, 1901, McKinley was shot and wounded on the grounds of the Pan-American Exposition in Buffalo, New York, the day after he had made a major speech advocating an end to American isolationism and promoting his plan to negotiate reciprocal trade agreements with other countries. The shooter was a Polish anarchist, Leon Czolgosz. McKinley appeared to be recovering when visited by Roosevelt in Buffalo, and after receiving assurances of a complete recovery from McKinley’s doctors, Roosevelt left to join his family on vacation in the Adirondack Mountains in upstate New York. On September 13th, however, McKinley’s condition worsened with gangrene, and early the next morning he died in Buffalo. Roosevelt immediately boarded a private railroad train to take him south to Albany and then west to Buffalo. At about 7:00 a.m. the train crashed into a hand-car and nearly killed two men, but fifteen minutes later the train was on its way. Around 8:00 a.m. the train briefly stopped at Albany before proceeding west to Buffalo, arriving around 1:30 p.m. on the 14th. Two hours later, around 3:30 p.m. Roosevelt along with 50 dignitaries, family members and cabinet officials gathered in the library of the elegant Wilcox Mansion in Buffalo. U.S. District Judge John R. Hazel administered the presidential oath. Edmund Morris, Theodore Rex at 3-7 (Random House; New York; 2001). 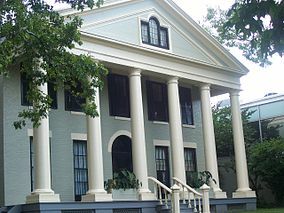 The Wilcox Mansion is now the Theodore Roosevelt Inaugural Historic Site and along with its collection of items from the Pan-American Exposition is open to the public.